Super-resolution microscopy is a pretty big thing right now. But there is more than one way to get super-resolution microscopy results. There are a variety of approaches, most involving expensive new microscopes that preclude many scientists from participating in science that allows them to ask certain questions. However, if they have access to a standard transmission election microscope and have antibodies that are glutaraldehyde tolerant, they can participate and ask questions that allow them to get around some of the inherent limitations imposed by physics. 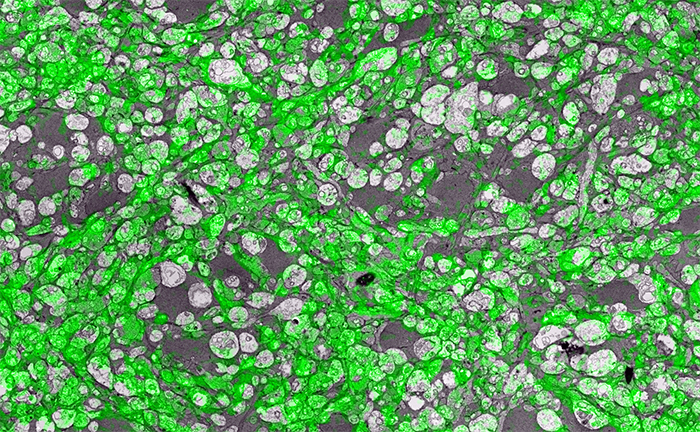 In the image above for example, we have GABA labeling in green superimposed upon ultrastructural data showing us *which* processes in the inner plexiform layer of the retina are GABAergic. Many of these processes are smaller than the wavelength of light. There are multiple ways to get here of course with some very expensive microscopes offering dual light and electron microscopy approaches and yet other microscopes offering purely optical based solutions. However, this is cheap and easy and accessible to many with the basic electron microscopy resources. Robert Marc first used this approach in back in 2000, and we subsequently used it for quite a bit of work for my Ph.D. dissertation in 2003, and notably in this paper. It is also an integral technique associated with our connectomics efforts. That said, I’ll need at some point soon to find the resources to get a traditional optical super-resolution microscopy solution to answer some questions we have in the lab on neural degenerative disease. This entry was posted in Daily, Ultrastructure and tagged ATEM, electron microscopy, GABA, retina, super resolution microscopy, TEM, transmission electron microscopy on March 2, 2019 by bwjones. We have a new publication out (direct link), Increasing Electrical Stimulation Efficacy in Degenerated Retina: Stimulus Waveform Design in a Multiscale Computational Model authored by Kyle Loizos, Robert Marc, Mark Humayun, James R. Anderson, Bryan W. Jones and Gianluca Lazzi. Abstract—A computational model of electrical stimulation of the retina is proposed for investigating current waveforms used in prosthetic devices for restoring partial vision lost to retina degen- erative diseases. The model framework combines a connectome- based neural network model characterized by accurate mor- phological and synaptic properties with an Admittance Method model of bulk tissue and prosthetic electronics. In this model, the retina was computationally “degenerated,” considering cellular death and anatomical changes that occur early in disease, as well as altered neural behavior that develops throughout the neurodegeneration and is likely interfering with current attempts at restoring vision. A resulting analysis of stimulation range and threshold of ON ganglion cells within retina that are either healthy or in beginning stages of degeneration is presented for currently-used stimulation waveforms, and an asymmetric biphasic current stimulation for subduing spontaneous firing to allow increased control over ganglion cell firing patterns in degenerated retina is proposed. Results show that stimulation thresholds of retinal ganglion cells do not notably vary after beginning stages of retina degeneration. In addition, simulation of proposed asymmetric waveforms showed the ability to enhance the control of ganglion cell firing via electrical stimulation. 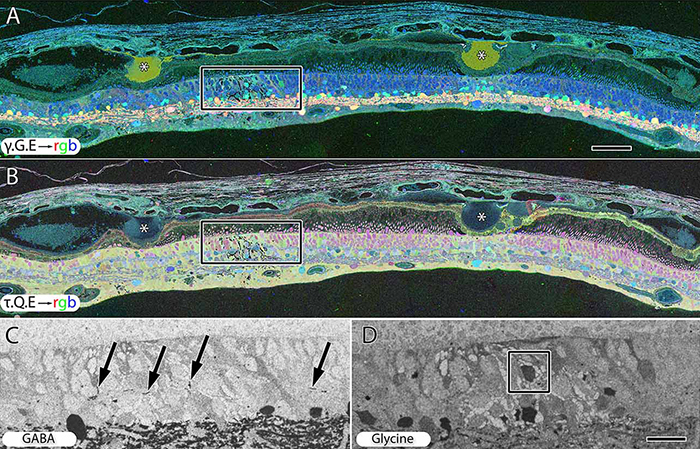 This entry was posted in Publications and tagged Bryan Jones, Bryan W. Jones, Bryan William Jones, electrical stimulation, Gianluca Lazzi, James R. Anderson, Kyle Loizos, Mark Humayun, retina, retinal modeling, Robert Marc on May 17, 2018 by bwjones. Centre for Eye Health, University of New South Wales (UNSW), Kensington, NSW, Australia. School of Optometry and Vision Science, UNSW, Sydney, NSW, Australia. Moran Eye Center, Univ of Utah, Salt Lake City, UT, United States of America. Purpose: To establish the correlation between visual field sensitivity and ganglion cell density within the central 20 degrees. We hypothesized that the use of a test stimulus within complete spatial summation (Goldmann II, GII) would display improved correlation compared to the standard GIII test stimulus. Methods:One eye of 40 normal subjectswas included in this study. The Humphrey Field Analyser (HFA) was used in full-threshold mode for the 10-2 test grid and 12 points from the 30-2 grid that matched the outer Spectralis grid. Spectralis OCT posterior pole scans for each subject was extracted and the average ganglion cell layer (GCL) thickness values were obtained for each of the 64 grid location within the measurement area ~6880µmx6880µm. HFA sensitivity in dB was plotted against GC density/mm3(calculated from GCL thickness and GC density from histological data, also converted into dB). Both visual field and OCT data were converted to a 50 year-old equivalent for analysis. The Drasdo et al VR 2007 correction was applied to visual field data to allow comparison of structure and function (Fig. 1). Linear regression analysis was conducted at each test location using individual data or grouped data derived using the 5, 6, 7 and 8 GC iso-density theme classes of Yoshioka et al IOVS 2017 (Fig. 1). A non-parametric bootstrap was used to determine the 99% distribution limits of the slope and correlation parameters. Results: Table 1 shows the structure-function correlation slope parameters and coefficients of determination (R2) for point-wise and theme class-based comparisons, using GII and GIII. The use of 5 or 6 theme classes resulted in a slope close to unity and high R2values for GII. Table 2 shows the 99% distribution of the slope parameters and R2values for point wise comparisons and those using 5 theme classes again demonstrating superior correlations for GII (both slope and R2 significantly different p<0.01 compared to pointwise analysis). Correcting the data for test size difference (6dB) did not result in data superposition confirming that GIII test size is not within complete spatial summation within the central 20 degrees. Conclusions:Using a test stimulus within complete spatial summation (GII) and grouping sensitivities according to GC density test grids derived using pattern recognition (7 or fewer GC theme classes), revealed correlations close to unity with coefficients of determination (R2) >0.90. The high correlations achieved when using theme classes even when using individual datasets, suggests that an approach would provide a useful method to predict alterations of visual field sensitivity from OCT data. Grant support: NHMRC 1033224;Guide Dogs NSW/ACT; NIH EY02576, EY015128, EY014800, an Unrestricted Grant to the Moran Eye Center from Research to Prevent Blindness. This entry was posted in Abstracts and tagged ganglion cell, retina on May 16, 2018 by bwjones. We have a new publication in IOVS, Pattern Recognition Analysis of Age-Related Retinal Ganglion Cell Signatures In The Human Eye (Direct link here). Authors are: Nayuta Yoshioka, Barbara Zangerl, Lisa Nivison-Smith, Sieu Khuu, Bryan W. Jones, Rebecca Pfeiffer, Robert Marc, and Michael Kalloniatis. 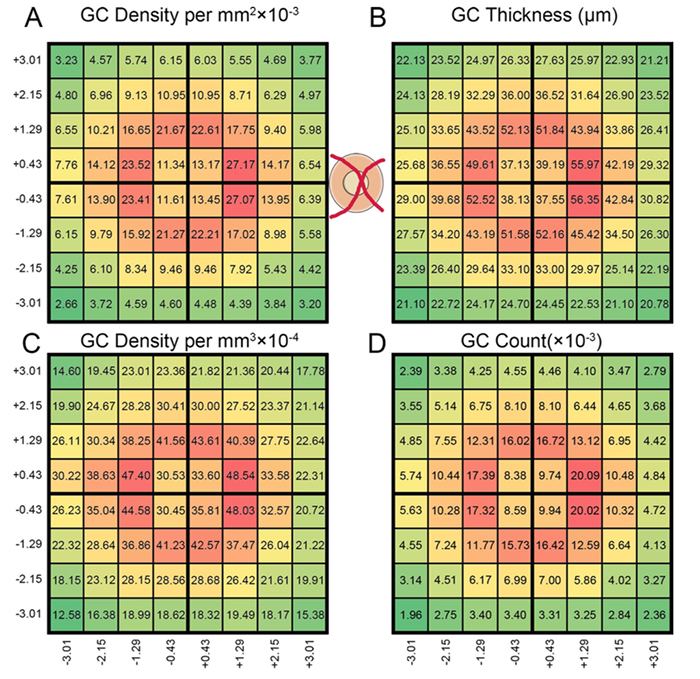 Purpose: We recently used pattern recognition analysis to show macula areas can be classified into statistically distinct clusters in accordance to their age-related retinal ganglion cell layer (RGCL) thickness change in a normal population. The aim of this study was to perform a retrospective cross-sectional analysis utilizing a large cohort of patients to establish accuracy of this model and to develop a normative dataset using a 50-year-old equivalent cohort. Methods: Data was collected from patients seen at the Centre for Eye Health for optic nerve assessment without posterior pole disease. The grid-wise RGCL thickness was obtained from a single eye of each patient via Spectralis OCT macular scan over an 8×8 measurement grid. Measurements for patients outside the 45-54 age range (training cohort) were converted to 50-year-old equivalent value utilizing pattern recognition derived regression model which, in brief, consists of 8×8 grid clustered into 8 distinct classes according to the pattern of RGCL thickness change with age. Accuracy of the predictions was assessed by comparing the training cohort’s measurements to the 45-54 year reference cohort using t-test and one-way ANOVA. Results: Data were collected from a total 248 patients aged 20 to 78.1 years. 80 patients within this group were aged 45 – 54 and formed the reference cohort (average±SD 49.6±2.83) and the remaining 168 eyes formed the training cohort (average age±SD 50.7±17.34). Converted values for the training set matched those of the reference cohort (average disparity±SD 0.10±0.42µm, range -0.74-1.34µm) and were not significantly different (p > 0.9). Most variability was observed with patients above 70 years of age (average disparity±SD -0.09±1.73µm, range -3.67 to 6.16µm) and central grids corresponding to the fovea (average disparity±SD 0.47±0.72µm, range -0.22 to 1.34µm). Conclusions: Our regression model for normal age-related RGCL change can accurately convert and/or predict RGCL thickness for individuals in comparison to 50-year-equivalent reference cohort and could allow for more accurate assessment of RGCL thickness and earlier detection of significant loss in the future. Caution may be needed when applying the model in the foveal area or for patients older than 70 years. This entry was posted in Publications and tagged Barbara Zangerl, Bryan Jones, Bryan W. Jones, Bryan William Jones, BWJones, ganglion cell, Lisa Nivison-Smith, Michael Kalloniatis, Nayuta Yoshioka, Rebecca Pfeiffer, retina, Robert Marc, Sieu Khuu on June 22, 2017 by bwjones. We have a new publication out (direct link), The rod-cone crossover connectome of mammalian bipolar cells authored by Scott Lauritzen, Crystal Sigulinsky, James Anderson, Michael Kalloniatis, Noah Nelson, Danny Emrich, Chris Rapp, Nicolas McCarthy, Ethan Kerzner, Mariah Meyer, Bryan W. Jones, and Robert Marc. Abstract: The basis of cross-suppression between rod and cone channels has long been an enigma. Using rabbit retinal connectome RC1, we show that all cone bipolar cell (BC) classes inhibit rod BCs via amacrine cell (AC) motifs (C1-6); that all cone BC classes are themselves inhibited by AC motifs (R1-5, R25) driven by rod BCs. A sparse symmetric AC motif (CR) is presynaptic and postsynaptic to both rod and cone BCs. ON cone BCs of all classes drive inhibition of rod BCs via motif C1 wide-field GABAergic ACs (γACs) and motif C2 narrow field glycinergic ON ACs (GACs). Each rod BC receives ≈ 10 crossover AC synapses and each ON cone BC can target ≈ 10 or more rod BCs via separate AC processes. 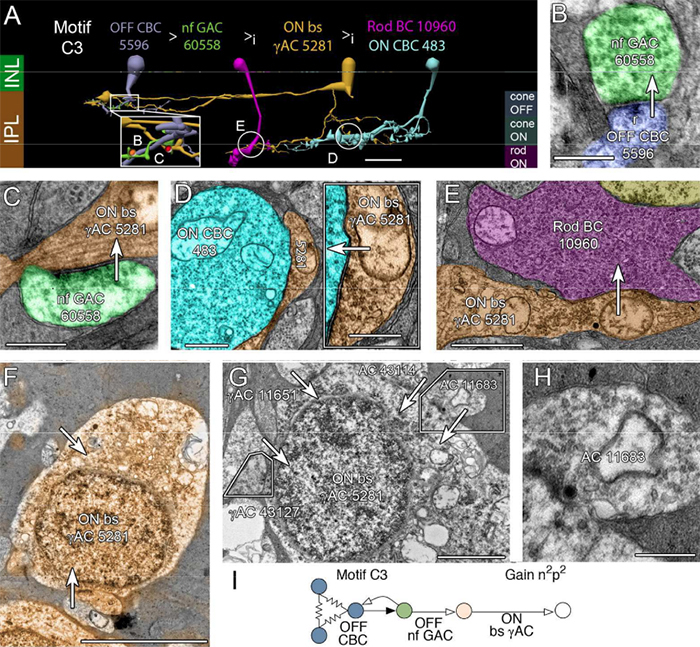 OFF cone BCs mediate monosynaptic inhibition of rod BCs via motif C3 driven by OFF γACs and GACs and disynaptic inhibition via motifs C4 and C5 driven by OFF wide-field γACs and narrow-field GACs, respectively. Motifs C4 and C5 form halos of 60-100 inhibitory synapses on proximal dendrites of AI γACs. Rod BCs inhibit surrounding arrays of cone BCs through AII GAC networks that access ON and OFF cone BC patches via motifs R1, R2, R4 R5 and a unique ON AC motif R3 that collects rod BC inputs and targets ON cone BCs. Crossover synapses for motifs C1, C4, C5 and R3 are 3-4x larger than typical feedback synapses, which may be a signature for synaptic winner-take-all switches. This entry was posted in Connectomics, Publications and tagged amacrine cell, bipolar cell, Bryan Jones, Bryan William Jones, BWJones, Chris Rapp, connectome, connectomics, Crystal Sigulinsky, Danny Emrich, Ethan Kerzner, ganglion cell, James Anderson, Mariah Meyer, Michael Kalloniatis, neuron, Nicolas McCarthy, Noah Nelson, retina, Robert E. Marc, Robert Marc, Scott Lauritzen, ultrastructure on August 5, 2016 by bwjones. 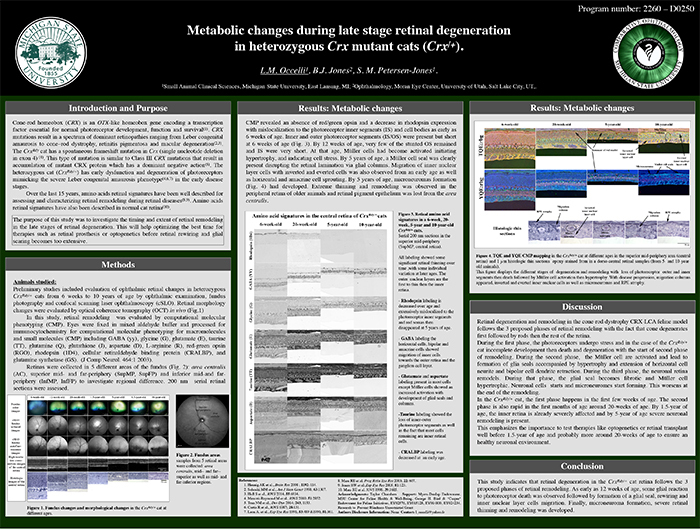 This poster was presented today, May 2th at the 2016 Association for Research in Vision and Opthalmology (ARVO) meetings in Seattle, Washington by Rebecca L. Pfeiffer, Bryan W. Jones, and Robert E. Marc. Purpose:Retinal degenerations are a collection of neural disorders, usually precipitated by photoreceptor degeneration. All display progressive metabolic alterations and neural loss following the death of the photoreceptors. Although it has been demonstrated that the metabolism of Müller cells (MCs) is drastically altered in degeneration, the full impact of these changes on surrounding neurons and long-term characterization of remodeling was previously unavailable, due to short lifespans of model organisms. Methods:Retinal samples were collected from WT and Tg P347L rabbits at ages ranging from 3 months to 6 years. Following enucleation, retinas were divided into fragments and incubated for 10 minutes at 35 degrees C in D-isomers of Glutamate (dE), Glutamine (dQ), or Aspartate (dD) and Ames-bicarbonate medium to explore retinal transport capabilities at each stage of degeneration. Retinas were then fixed in mixed aldehyde buffer and processed for transmission electron microscope connectomics, immunocytochemistry for a range of macromolecules, and computational molecular phenotyping for small molecules (CMP) (J Comp Neurol. 464:1, 2003). Results:CMP reveals that single metabolic phenotype of MCs splits and diverges into many phenotypes continuously throughout degeneration. Further, all neuronal classes continue to die throughout degeneration. By 6 years, over 90% of neurons are lost, and the remaining glutamatergic neurons have altered metabolic signatures with a large increase in aspartate levels, at times exceeding glutamate. Transport of the D-isomers indicates that glutamate transport capabilities remain intact until the latest stages of degeneration. This may not be true of their GABA transporters. Conclusions:These results suggest three main conclusions. First, retinal remodeling in degeneration is relentlessly progressive long after all photoreceptors have disappeared. Second, cell types previously thought to remain after degeneration onset, such as ganglion cells, will also ultimately die and the cells not lost often will change their metabolism. The consequence of this metabolic change in neurons is not yet fully explored. Third, the persistent robust glutamate transport capabilities of Müller cells indicate Müller cells can metabolize glutamate despite the massive loss of glutamine synthetase activity, likely unmasking alternate metabolic pathways. 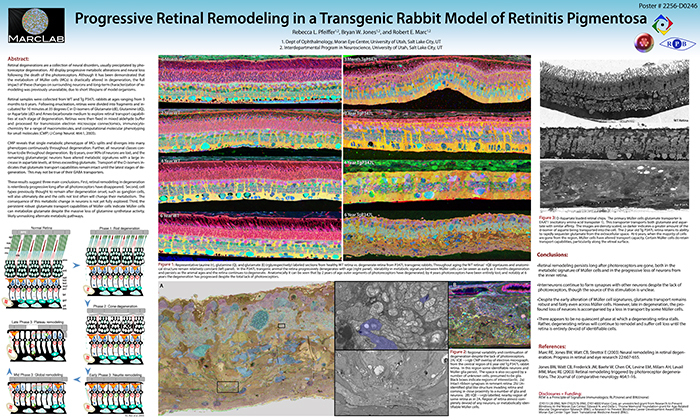 This entry was posted in Abstracts, Retinal Disease, Retinal Remodeling and tagged ARVO, ARVO 2016, ARVO poster, Bryan W. Jones, P347L, Rebecca L. Pfeiffer, retina, retinal degeneration, retinitis pigmentosa, Robert E. Marc, RP on May 3, 2016 by bwjones. This abstract was presented today, May 2th at the 2016 Association for Research in Vision and Opthalmology (ARVO) meetings in Seattle, Washington by Laurence Occelli, Bryan W. Jones, and Simon M. Petersen-Jones. Purpose: CRX is a transcription factor essential for normal photoreceptor development and survival. The CrxRdy cat has a spontaneous mutation in Crx. Early disease stages in heterozygous cats (CrxRdy/+) mimics severe Leber’s congenital amaurosis. This study investigated the timing and extent of retinal remodeling in the late stages of retinal degeneration. This will help optimizing the best time for therapies such as retinal prosthesis or optogenetics before retinal rewiring and glial scar become too extensive. Methods: CrxRdy/+ cats from 6 weeks to 10 years of age were investigated. Eyes were fixed in mixed aldehyde buffer and processed for immunocytochemistry for computational molecular phenotyping for macromolecules and small molecules (CMP) including GABA, glycine, glutamate, taurine, glutamine, aspartate, rhodopsin and red green opsin (J Comp Neurol. 464:1 2003). Samples from 5 retinal areas were collected: area centralis, mid- and far-superior as well as mid- and far-inferior regions. Results: CMP revealed an absence of red green opsin and a decrease in rhodopsin expression with mislocalization to the photoreceptor inner segments (IS) and cell bodies as early as 6 weeks of age. Inner and outer photoreceptor segments (IS/OS) were present but short at 6 weeks of age. By 12 weeks of age, very few of the stunted OS remained and IS were very short. At that age, Müller cells had become activated initiating hypertrophy, and indicating cell stress. By 5 years of age, a Müller cell seal was clearly present disrupting the retinal lamination via glial columns. Migration of inner nuclear layer cells with inverted and everted cells was also observed from an early age as well as horizontal and amacrine cell sprouting. By 5 years of age, microneuromas formations had developed (Fig.1). Extreme thinning and remodeling was observed in the peripheral retina of older animals and retinal pigment epithelium was lost from the area centralis. Conclusions: This study indicates that retinal degeneration in the CrxRdy/+ cat retina follows the 3 proposed phases of retinal remodeling. As early as 12 weeks of age, some glial reaction to photoreceptor death was observed followed by formation of a glial seal, rewiring and inner nuclear layer cells migration. Finally, microneuroma formation, severe retinal thinning and remodeling was developed. This entry was posted in Abstracts, Retinal Disease and tagged ARVO, ARVO poster, Bryan W. Jones, CRX, Laurence M. Occelli, retina, Simon M. Petersen-Jones on May 3, 2016 by bwjones. This abstract was presented today, May 2th at the 2016 Association for Research in Vision and Opthalmology (ARVO) meetings in Seattle, Washington by Jefferson R. Brown, Rebecca L. Pfeiffer, Crystal Sigulinsky, Felix Vazquez-Chona, Daniel Emrich, Bryan W. Jones, Robert E. Marc. Purpose:Retinal vasculature is strongly affected by degenerative pathologies and in turn, may also contribute to their progression. However, much of what we understand about the normal, healthy interaction between neurons, glia, and blood vessels at the ultrastructural level is limited to single section electron microscopy. The technology of serial section transmission electron microscopy (ssTEM) extends the high definition of TEM imaging into three dimensions to create volumes, allowing for more thorough visualization and analysis of the vascular-glial-neuronal complex. Methods:RC2 is a 40TB ssTEM volume of over 1,400 horizontal sections of retinal tissue derived from an adult female C57BL/6J mouse. The tissue sample is 250 um in diameter and spans the outer nuclear layer to the vitreal surface. Baseline resolution is 2.18nm per pixel. Visualization, navigation and metadata annotations of the database are made via the Viking software suite. Results:Much of the retinal vascular basement membrane directly contacts Muller cells. In the ganglion cell layer, direct basement membrane contact with astrocytes is frequent. Microglia commonly contact the basement membrane, and occasionally direct contact of neurons onto basement membrane was observed. 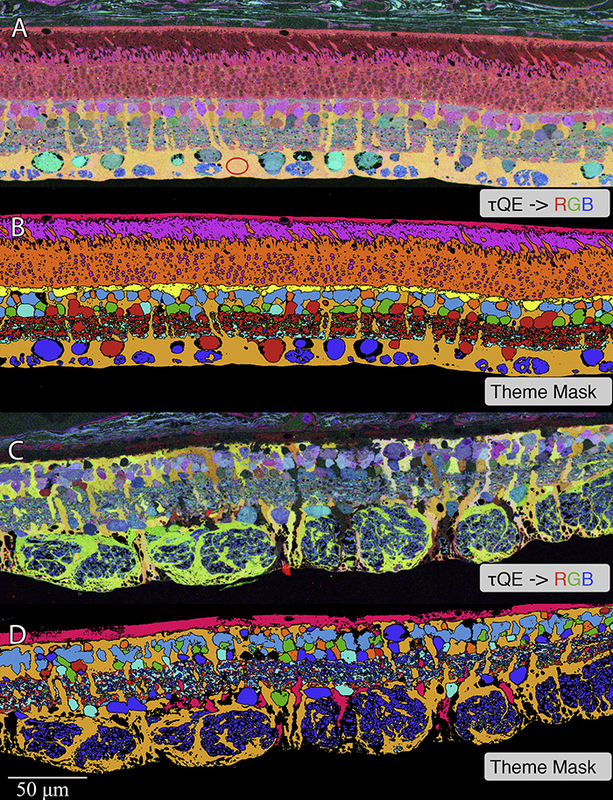 Full 3D reconstruction of all vascular pathways with associated endothelia and pericytes within the volume was completed, demonstrating that all the retinal capillary layers are continuous with one another [Figure]. Conclusions:The presence of occasional direct neuronal contact onto vascular basement membrane supports earlier work by Ochs and colleagues (2000) and suggests the blood-retina barrier does not universally involve retinal glia. However, since such contacts are extremely sparse, it remains to be seen whether this finding has biologic significance, though their existence suggests significance. The RC2 volume is a valuable resource to aid in discovery of defining characteristics of wild type neurovascular architecture. 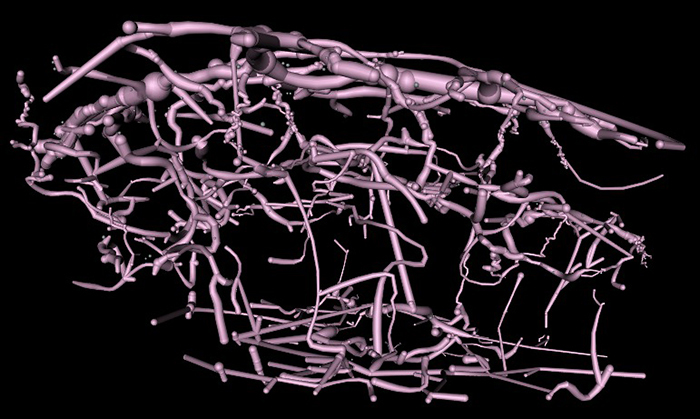 The intro figure is a side view of reconstruction of all vasculature within the RC2 volume. Vessels at the top of the figure correspond to the outer plexiform layer, while those at the bottom correspond to the ganglion cell layer. This capillary plexus is one continuous structure. 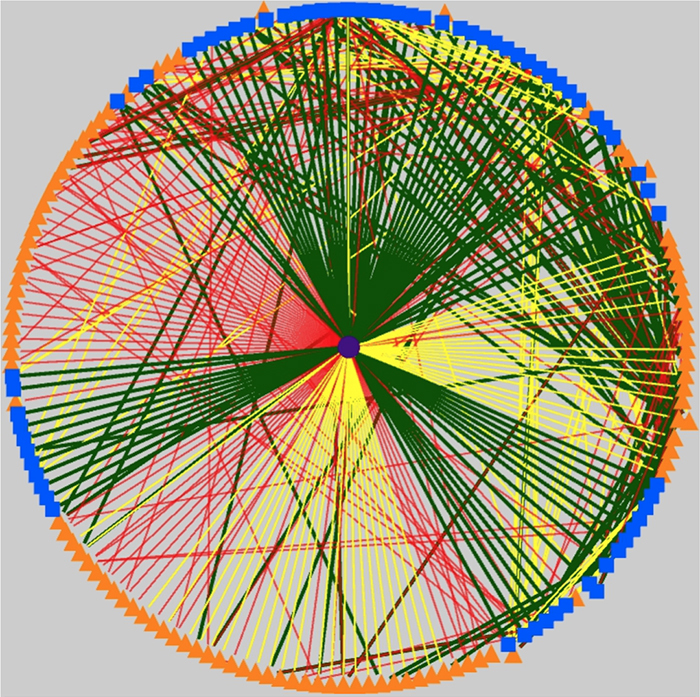 Visualization by VikingView software. This entry was posted in Abstracts, Connectomics and tagged ARVO, Bryan Jones, Bryan W. Jones, Bryan William Jones, BWJones, Crystal Sigulinsky, Daniel Emrich, electron microscopy, Felix Vazquez-Chona, Jefferson R. Brown, Rebecca L. Pfeiffer, retina, Robert E. Marc, ultrastructure, vasculature on May 2, 2016 by bwjones.